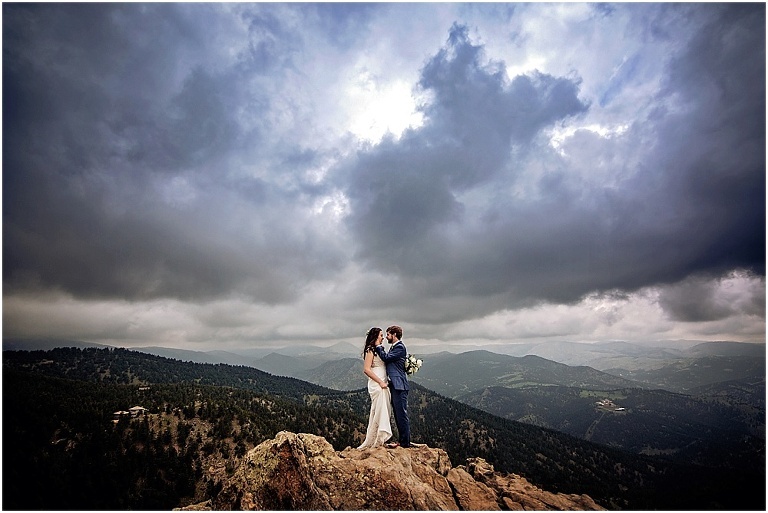 Katie and Brad were wed up on Flagstaff Mountain at Sunrise Amphitheater, an overlook just above Boulder, Colorado with stunning views of the town below. They had their families join them all the way from Indiana for their intimate ceremony up on the mountain. One of the great things about having an intimate wedding is having flexibility – when we saw the weather forecast and impending storms heading towards Boulder in the evening, we decided to move their ceremony and portraits up to 11:30 in the morning. This ended up being a fantastic decision, we were graced with a little bit of sunshine followed by some crazy intense pre-storm skies. After their intimate ceremony was concluded, we spend some time taking family portraits up at Sunrise Amphitheater. I love to include portraits of just your guests individually alongside the formal family portraits, when was the last time your parents/aunt and uncle/crazy cousins had a professional photo taken of just them?!? We said goodbye to Sunrise Amphitheater after a Champagne toast up on the mountain. To finish our time together, we headed to a few spots up on Flagstaff Mountain for some couple’s portraits. The sky started to turn a deep blue with distant rain once we headed over to Artist Point – which makes for some beautifully dramatic wedding portraits. We finished our time as the rain started to approach the Boulder area at Lost Gulch Overlook – which is one of my favorite places to take couples for portraits due to the dramatic rocks with the Continental divide in the background. Thank you, Katie and Brad, for inviting me to celebrate your Intimate Boulder Wedding with you! © 2019 Colorado Mountain Wedding Photographer|ProPhoto Photographer Site|Design by Northfolk & Co.